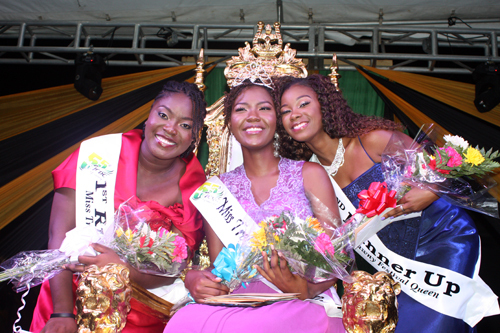 Trelawny will be represented at this year’s National Festival Queen Competition by Abreena Redden after she walked away with the parish crown on Sunday night. Miss Redden, a Sixth Form student at the Westwood High School in Trelawny, just about outdid six other contestants in what was deemed a closely contested affair on the grounds of the historic Falmouth cruise shipping port. Miss Redden also copped the sectional prizes of being Most Culturally Aware, Most Active in Community and Most Poised to go along with her title of being Miss Trelawny Festival Queen 2018. While her talent piece was well-received by patrons, the prize for Best Performer went to Shantol Johnson, who also copped the Most Congenial prize and was voted First Runner-Up. Second Runner-Up was copped by Seyline Thompson, while Britney Ingram copped the sectional prize for Most Popular on Social Media. Speaking to Miss Abreena Redden following her victory, she expressed that she was quite elated about winning the competition. She, however, disclosed that she was not expecting this based on the evident qualityof her competitors throughout the entire process. She is, however, now looking forward to representing the parish at the national finals in August. Until that time, she plans to work hard at her community project, which involves her collaborating and working with youths in her community to foster entrepreneurial thinking.